ISLAMABAD (APP): Despite curfew and strict restrictions protest demonstrations held in Srinagar, Pulwama, Islamabad, Shopian, Sopore, Kupwara, Kulgam and other areas of the occupied territory Saturday against the killing of three Mujahideen, including Hizbul Mujahideen commander Burhan Wani by Indian troops in Islamabad district. According to KMS, call for the strike was given by All Parties Hurriyet Conference Chairman Syed Ali Gilani, Mirwaiz Umar Farooq and Muhammad Yasin Malik. The authorities put almost all Hurriyet leadership under house arrest or in jail to thwart the protests. Burhan Wani , 21-year architect of the social-media driven psychological warfare in Kashmir , and two other Mujahideen were martyred during an encounter with Indian troops in Kukarnag area of south Kashmir on Friday. The news of Wani's death triggered massive anti-India and pro-freedom protests across the held valley and a shutdown call by Hurriyet leadership. Hundreds of people assembled in Tral, Wani's hometown, to participate in his funeral prayers. Several others performed funeral in absentia in south, central and north districts of occupied Kashmir . Clashes were reported after prayers in absentia were held in several areas, including Magam town. Mobile, internet and train services are suspended across the Valley. A senior police officer said forces' installations were attacked in south Kashmir and protesters were injured in late night clashes. 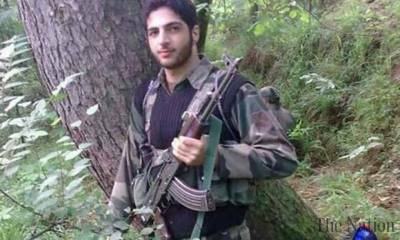 Wani waged psychological warfare by releasing videos and pictures online. A picture of him with 10 armed local youths went viral last year and made him the poster boy of the Hizbul Mujahideen. In his last video released in June, Wani was seen playing cricket with other Mujahideen. A top police officer told an Indian daily that Wani, who joined the militancy in 2010, had remained elusive because of his tremendous following online and on the ground. "Every time an operation was launched against Wani, our movement was reported to him by his huge network of young supporters and fans," said the officer.